You could make a wave runner block using Victoria's tutorial. 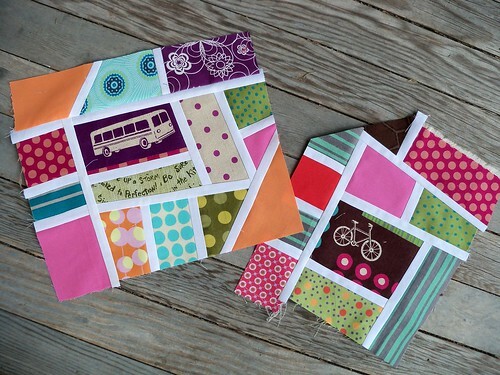 Or blocks like this using the Mod Mosaic Floor Pillow tutorial from Oh, Fransson! With both tutorials remember that your blocks will need to be 12.5 inches square if you want to use them with the other blocks in this sampler. 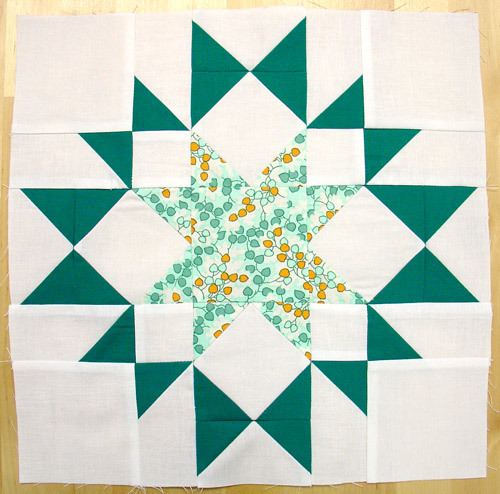 For a more traditional bonus block, you could make the Green Mountain Star block. It has quarter square triangles, flying geese and corner to corner sewing. Wow! Great review block and sooo pretty. Thanks to Em for sharing this block. If you make any of these blocks in any size leave a comment on the giveaway post for an extra chance to win. Happy sewing! I just love the pink block!